Inn-Phone Telephones - high quality Hotel Guest Room Telephones for the Customer Service Industry. We offer trim-line telephones to advanced SIP / VoIP telephones. Our guest room telephones are backed by our 100% Satisfaction Guaranteed Warranty. 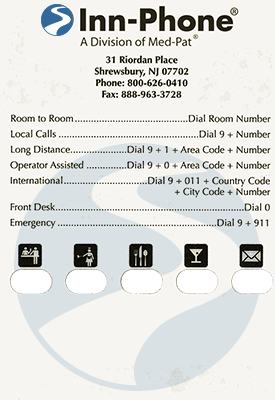 Inn-Phone has been the guest room telephone of choice for over 15 years for many Inns, Hotels, Motels, and Guest Service establishments. 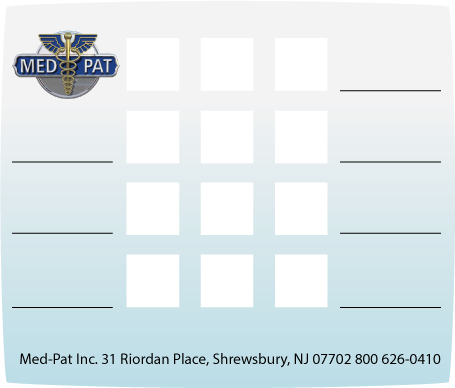 Backed with the experience of Med-Pat, the parent company that supplies telephones to Hospitals and Medical Centers, we have been the phone of choice for thousands of hotel properties around the country. Inn-Phone produces the best guest room phones you can buy. InnPhone offers motel phones and hotel phones that are cost efficient and perfect for your guestroom telephone requirements. Our phones cover the needs of Motel and Hotel Phones due to our wide range of available models and features. Our D2600 is a Traditional Deskset Telephone with Classic Styling yet modern features. Looking for a SIP / VoIP (Voice over IP solution)? Our D5900 is a "heavy base" Programmable SIP Telephone available in multiple configurations. The TL-IP is a Trimline SIP & VoIP phone for hotels using the latest VoIP SIP technology. Review any of our telephones for more detailed product specifications and descriptions by clicking Our Phones in the top Navagation Bar or from the list below. The D5000 is a two-line speakerphone room phone with a Heavy Base that provides longevity and durability. The D520 is Inn-Phone's most popular guest room telephone for hotels and motels. Deluxe Euro Style Single Line Console Telephone with extra large Faceplate. Full Duplex Speaker Console Telephone with extra large Faceplate. Deluxe Power Over Ethernet SIP Speakerphone compatible with most popular IP-PBX switches. Full Featured Speaker Telephone with Dataport. Available with 3 programmable keys! Most Widely Used Trimline Telephone in America Today! Available in Beige, Black or Red. SIP VoIP Trimline Telephone. 1st SIP / IAX Compatible Heavy Base Trimline for Hotel / Motel Applications! Looking for an amplified consumer telephone for the hearing impaired? Visit HearingImpairedPhones.com to buy our consumer products, many featuring the same great phones used in Medical and Guest Room telephone services. Inn-Phone is actively recruiting dealers to resell our complete line of hotel room phones. If you frequently work with hotels and motels and install or support hotel telephone communication systems, then we’d like to work with you! Inn-Phone produces the best guest room telephones which allows selling to those that want to buy telephones for hotels, that much easier. Inn-Phone boasts the most durable and feature packed telephones available today. We offer two versions of our Product Catalog. Please choose the version which best suits your needs. Suited for quick navigation and display on multiple devices.